The aroma of meat and vegetables in a wine and beef sauce permeates the house, and makes you salivate. Comfort food cooking and you just can’t wait for dinner. Everyone loves comfort food. Especially when the weather is dreary or our mood needs a pick-me-up. One of my family’s favorite comfort food meals is beef short ribs. They have such a deep, tender flavor, and make the most delicious sauce. A stick to your ribs (no pun intended), dinner that leaves everyone satisfied. You don’t need to spend hours in the kitchen, preparing a five course dinner, to please your family. You only need to meld flavors together to create the perfect dish. Use your favorite blend of spices and you get an explosion of flavors in your mouth. What’s the best part of this comfort food meal? It’s easy to prepare. Short ribs require very little prep, and even a novice cook can make them. Brown the ribs, sauté your favorite aromatic veggies, then cook everything low and slow in a wine and beef broth. The result is fall off the bone, flavor packed ribs and veggies in a sauce that melts in your mouth. You don’t like wine? 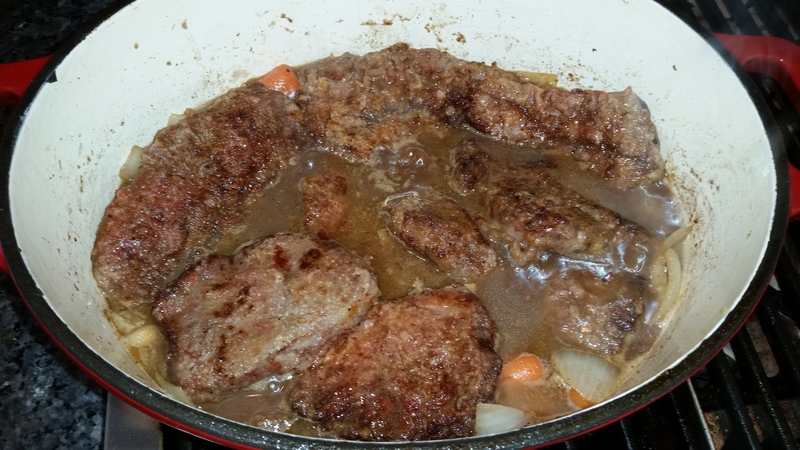 Change your braising liquid from wine to beer. Perhaps you like hoisin or tomato sauce. Maybe a combination of both. You are in control. Not a huge garlic fan, leave it out. Is cumin your favorite spice? Add it. Whatever your preference, the result is fall off the bone, flavor packed ribs and veggies in a sauce that melts in your mouth. Another great thing about short ribs, you can make them in advance. Short ribs are forgiving when it comes to cooking time, and they taste even better the next day. Want a great dinner party food? Beef short ribs. Make them the day before and reheat them the day of the party. You won’t be spending all your time in the kitchen—you can enjoy your guests. I have never made or even tried short ribs. Your description of this dish makes me want at least taste them! Maybe I will even break down and give it a try. Never know maybe the picky eaters in my house will like it! Thanks for sharing! Thanks Barb. These can be made in a crock pot too. Just do the browning and transfer. Let us know how the picky eaters like them. I made mashed potatoes as the side, but they are great with rice or noodles too! Happy cooking. Short ribs are one of my favorites. Easy and yummy? That’s two for the price of one. Thanks Staci. I agree. Easy and yummy, and the house smells great all day! I cook short-ribs in a crock pot, on low for up to 8 hours. I don’t use wine or beer, but Dr. Pepper! You can’t taste the soda once they are cooked, but the ribs do have a bit of a sweeter taste to them. Sounds great. Definitely something to try. Thanks for sharing. I love your descriptions from the cookies that you’ve made to the short ribs. I can almost smell the food cooking and rolls baking. Thank you Tom. I hope that you try the recipe.